Home Tech Gist Uber Breakup Shop: Will Help You End Any Relationship For Real!! Uber Breakup Shop: Will Help You End Any Relationship For Real!! Breaking up with some one you love especially someone you have dated for a long time is not an easy thing to do. Most folks find it difficult to do despite the fact that you really need to work out of it when it's not really moving or sure that is in a state of stagnant. Internet isn't only for booking hotel room, flight ticket, making purchase online you can also use Internet to break up too. I came across a company who can help you do the man up for you, lol, they will help you end that relationship you find it difficult to do. 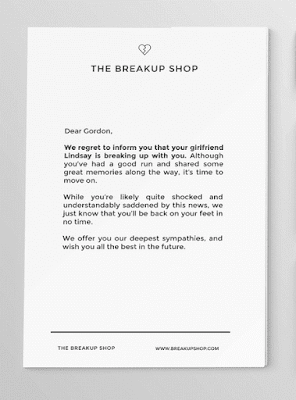 Meet Breakup shop, the website for those without the backbone to end a relationship. 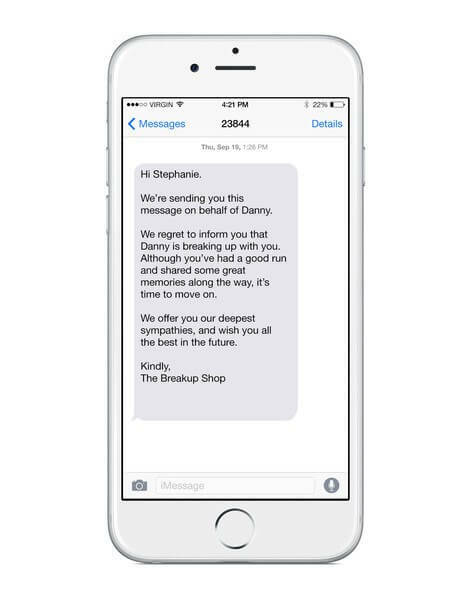 The Breakup Shop will help you end your relationship via a text ($10), phone call ($29), or letter ($30). You can also spice things up with a Breakup gift pack for $80 this includes a copy of Call of Duty: Ghosts, a $30 Netflix gift card, a Blu-ray copy of the Notebook, a pack of cookies and a sympathy letter. Here are some of their break up letter samples you might want to look at. This is not an internet hoax, this is real! 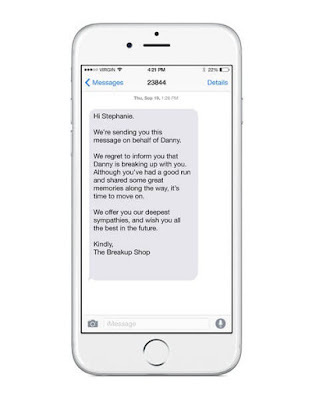 Since they launched the website last week to the 12th of November, the Breakup Shop made three breakup calls and delivered six breakup texts. Asides this, you can also volunteer to become a heart-breaker.